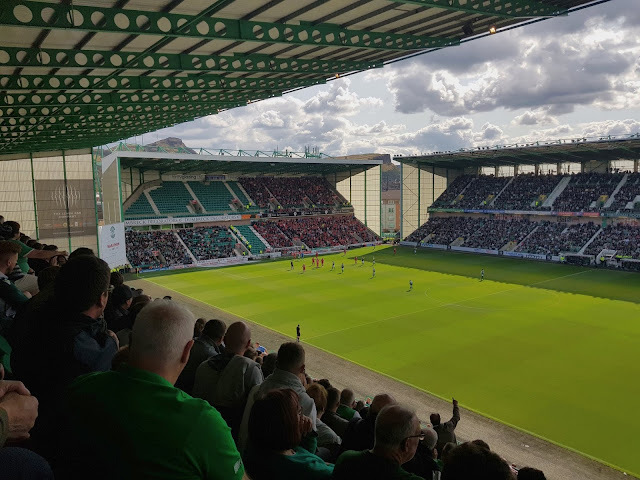 My twentieth ground of 2018 was on Saturday 25th August at Easter Road in Leith, Edinburgh, Scotland. The match was Hibernian vs. Aberdeen in the Scottish Premiership. Easter Road is located to the north-east of the city centre. It is in a predominantly residential area with most of the ground bordered by housing save a conference centre to the west and a cemetery to the north. The venue is 1.3 miles north-east of the city's main railway station of Edinburgh Waverley and has been home to the club since 1893. The current stadium was gradually reconstructed over a 15-year period starting in 1995 to bring it up to a modern standard. The oldest stands from this time are the North and South Stands at either end of the ground. These two-tier all-seater stands replaced the old single-tier terraces and each have a capacity of just under 4,000. Due to the road layout around the ground the two stands are mirrored so the North Stand tapers off in the north-west corner and the South Stand tapers off in the south-east corner. Both stands have function rooms looking out onto the pitch for around half the area at the back of the lower tier. The West Stand is a two-tier structure built in 2001 to replace what was the oldest surviving stand at the venue. It has a capacity of around 6,400 and contains the reception, offices and dressing rooms. The players tunnel runs out to the centre of the lower tier with the two dugouts either side of it. The middle section of seating in the upper tier houses the media area as well as corporate seats. The main suites are inside the stand and there is access to a sports bar at the back of the lower tier. The newest stand is the East Stand - this also has a capacity of around 6,400 and is the only single-tier stand at Easter Road. This was constructed in 2010 replacing a stand that had only been there for a quarter of a century. Despite only opening in 1985 the old East Stand dated quickly and by the time it was demolished was the smallest stand and also had a lot of supporting beams holding up the roof. 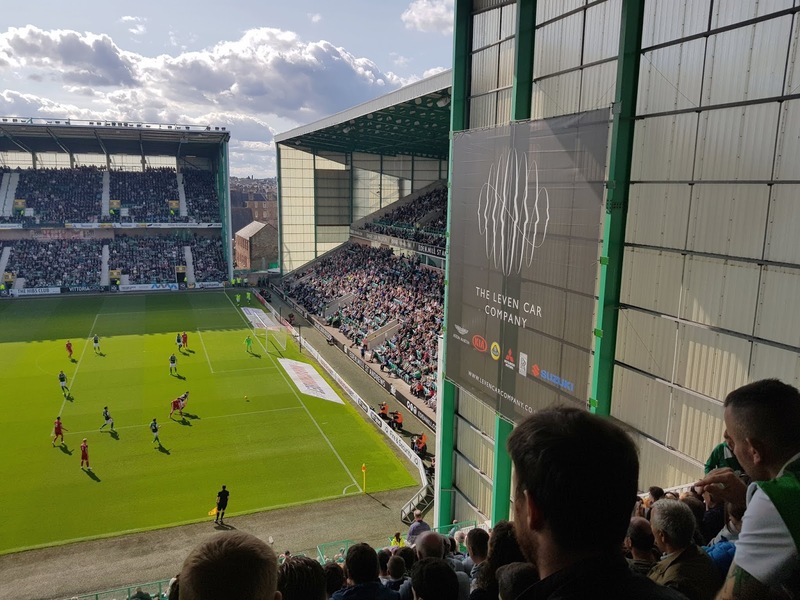 The newer cantilever roof stand is now at the same height as the other three stands giving Easter Road a much neater look. 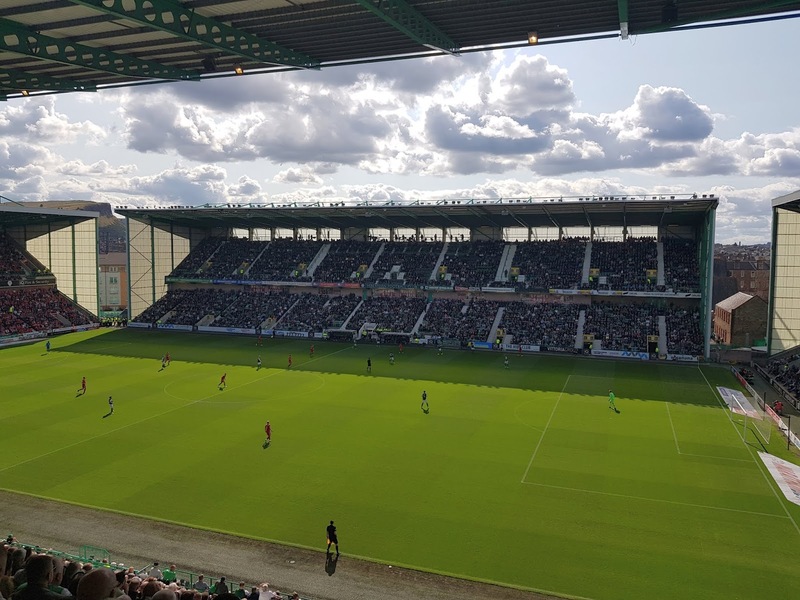 Hibernian started the match the stronger of the two sides and went close after a quarter of an hour. Lewis Stevenson picked up the ball on the right wing, spotted Daryl Horgan was in acres of space in the centre and laid the ball off to him. Horgan advanced into the area before forcing Aberdeen keeper Joe Lewis into a spectacular save to tip the ball to safety. The hosts enjoyed the greater amount of ball time in a fairly quiet first 45 minutes but conceded against the run of play in messy fashion in first half injury time. It came about from an Aberdeen corner where the original ball to the back post was nodded into the centre of the six-yard box by Stevie May. Tommie Hoban volleyed a shot at home keeper Adam Bogdan who failed to fully save the shot leaving the ball precariously sitting on the goal line. 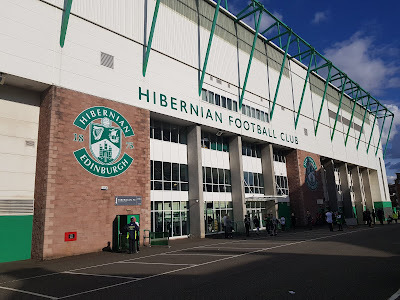 Hibernian's defence remained static throughout this whole passage of play allowing Hoban to poke the ball across the line to give his lead the lead. 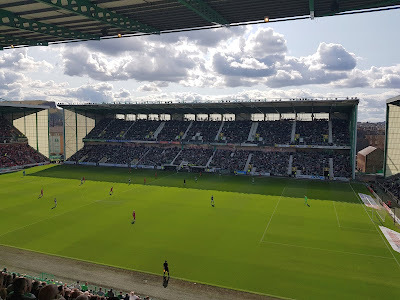 The second half was similar to the first with Aberdeen happy to sit back on their lead as Hibs huffed and puffed to try and force an equaliser. Eventually this paid off through a neat move with 5 minutes left on the clock. As the hosts built up an attack they were able to lure the Aberdeen right-back away from his man leaving Paul Hanlon free inside the area. 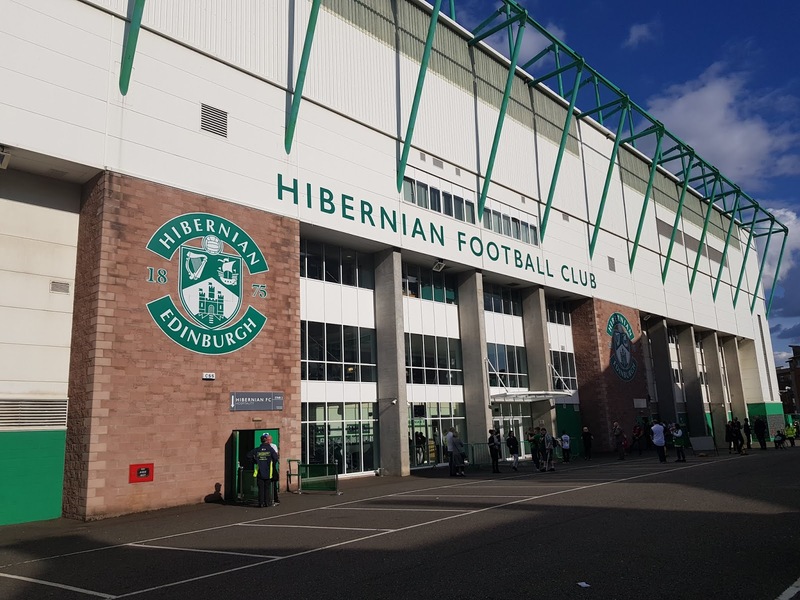 Hanlon had time to send the ball across the six yard line where Jamie Maclaren was there to knock the ball in to ensure Hibs rescued a late point out of the game.